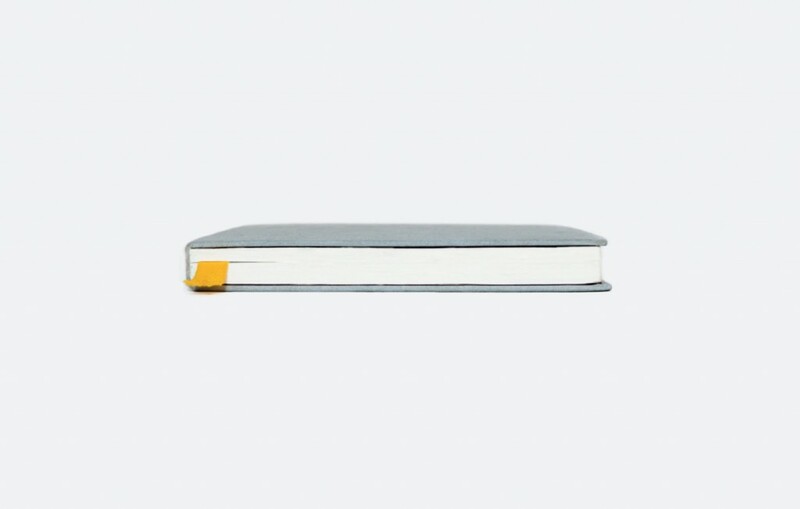 I picked up the Baron Fig Confidant notebook after following their progress on Kickstarter. It looked interesting enough at the time, but not so much that I couldn’t wait until they were made available to the general public. That said, I was intrigued enough that I ordered one as soon as they were. I do have to say that they have put a lot of thought and effort into every aspect of it’s presentation. The website is beautifully designed. 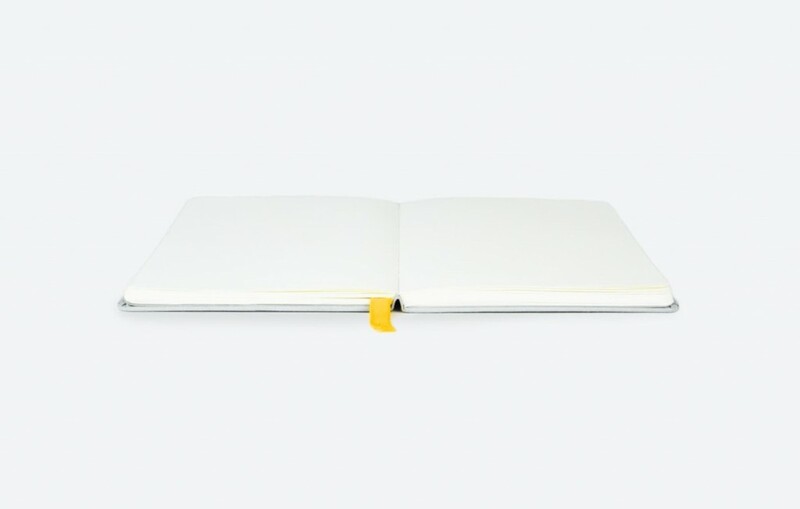 It features their Idea Series of video profiles of people using the notebooks from many creative walks of life — musicians, dancers, builders, etc. The story behind the product is told very well. The notebook (I ordered the blank style) comes in a sturdy box that makes for a dramatic reveal. 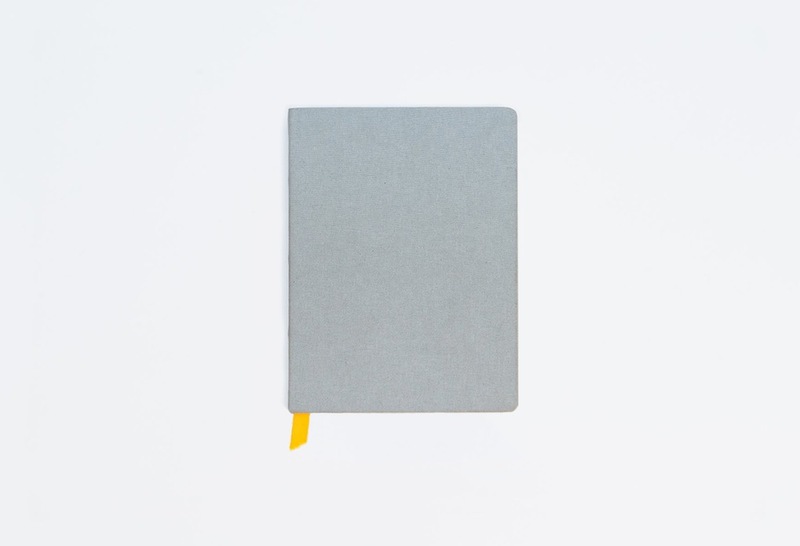 The notebook itself is cloth-bound in a pleasing grey fabric with a yellow cloth bookmark ribbon. It looks nice — but not too nice. If I had to pick a single word to describe it overall I would say it is “approachable”. 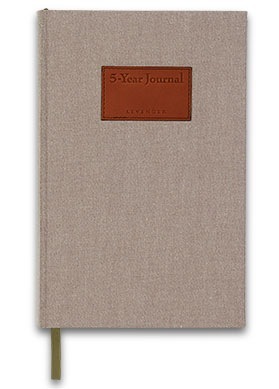 At $15.95, these are not inexpensive notebooks. But, it is the myriad of thoughtful details that I think ticks up the value equation. The 192 pages of thick paper that takes most pens, inks, and markers well. The 12 perforated pages in the back, in case one needs to share a note. Even the dimensions are different than many others. In fact, it is exactly the same height and width of an iPad mini (I’ve been told this was not a mistake). This gives it a bit more breathing room than, say, a large Moleskine — the buyers of which is the crowd this seems most targeted to. Over all, I think they did a great job with this. It is certainly a notebook I could see myself using on a daily basis. Especially for the notes and writing I care about taking a bit more care to preserve. It is certainly not cheap but notebooks of this quality generally aren’t. I would recommend this to anyone who is in the market and I look forward to seeing how The Confidant stands up to regular use. This post was first drafted in The Baron Fig Confidant Notebook using a Kaweco Sport fountain pen with an EF nib and a Kaweco black ink cartridge. A scan of the draft is available for download (PDF). Patrick Rhone – Writer | Three things to read, watch, and use. A good pen. Actually, consider two. One good one that you can enjoy using every day. And, one really good one that you use for special occasions. Like signing a bonus check, birthday card, or writing a letter to an old friend. I have far too many in both categories so I won’t recommend a specific one here. I will say that I keep a Uniball Signo 207 Micro on me at nearly all times. It’s a good pen that is inexpensive that I don’t mind losing and replacing. I was recently invited to contribute to Mike Dariano’s Three Things To Read, Watch, and Use series at 27goodthings.com. The quote above is appropriate for here. Find a pen in your hand? Write. Your notebook is in front of you? Write. — Randy Murray — The Best Time To Write — First Today, Then Tomorrow. My snapshot of my desk as I wrote this. Welcome. I’m glad you found your way here. 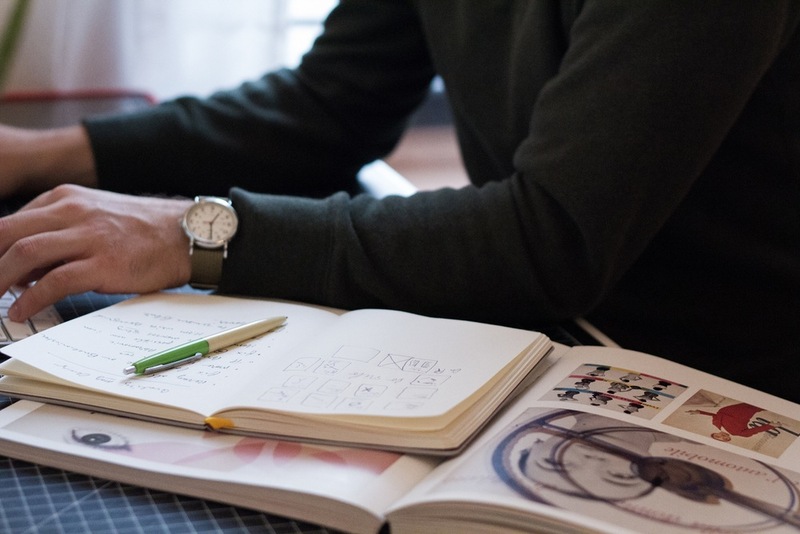 If you are the sort of person who appreciates nice paper, a decent pen, a well-crafted notebook, a solid pencil, writing and receiving handwritten correspondence, beautiful handwriting, or the clicky-clack of a dependable typewriter, you have come to the right place. The Cramped is a site dedicated to the pleasures of writing with analog tools (the name is purposefully ironic). My name is Patrick Rhone and I have been writing all of my life. I like technology as much as any modern citizen, but none gives me the pleasure that writing by hand — using pen and paper — does. 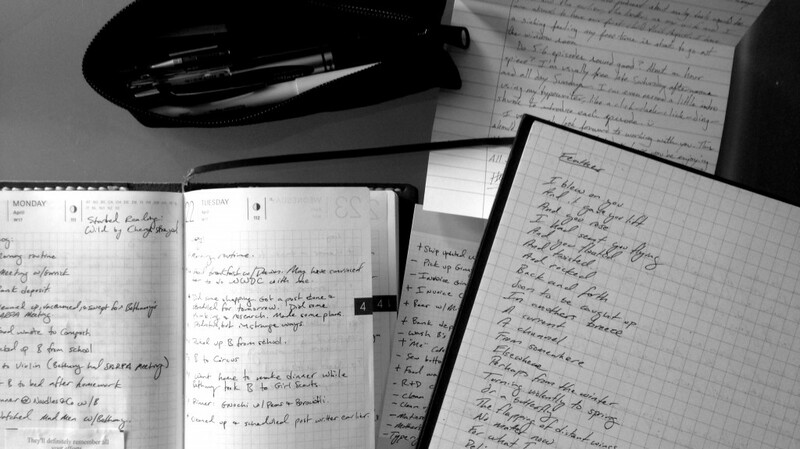 I have long preferred to journal by hand, take notes by hand, and am currently writing my first book entirely by hand. This grows out of a life long love of nice pens, good paper, solid typewriters, and an appreciation of analog writing and publishing tools of all sorts. This is also an area where my normal goals of minimalism and simplicity in my life completely break down. I have more pens then I could ever use in my lifetime. My stack of brand-new notebooks reaches over two feet high — and I can’t seem to resist buying more. This is all to say that this site, at the least, will provide much needed justification to my addictions. Because, then I can buy new notebooks or pens or paper or ink “for the site”. I can tell my wife that my readers demand it! I will have other semi-regular contributors as well. The first of these is Harry C. Marks. A writer who not only appreciates such tools as much as I, but has also written a book or two on his late ’50s Smith-Corona Sterling typewriter (of which I am most jealous). The typeface used in the header is Mike Rohde’s Sketchnote Typeface and may be purchased at Delve Fonts. A special thanks to Mike and Delve for their support and blessing. There will be some other goodies coming soon as well. A podcast is in the works. And, I’m working to line up some giveaways and exclusive specials for our readers. In all, I hope to pour some time into this and make this site a primary project for my endless interest in this area. For now, take a look around and enjoy. The study, published in the journal Psychological Science, compared how well more than 300 students retained information after taking notes on 15-minute TED Talks either by hand or with a laptop. Across three different experiments, the researchers found that taking notes with a laptop can be detrimental to learning. Both groups performed about the same when recalling facts from the lectures half an hour later, but longhand note-takers were much better at recalling concepts. I’ve known this to be true for myself for a very long time and from other past studies (hence the reason I do it). Nice to see it continue to be validated by science. Many of my long time readers and those that follow me on Twitter and elsewhere, know how long and deep my love affair with Levenger runs. I have been a customer for over 20 years now. Words are not enough to describe the quality of their products, the attention to detail, or the outstanding customer service. Properly maintained, Levenger products are made to last a lifetime and then be passed along to your descendants for theirs. I recently purchased a Levenger 5-Year Journal and it is true to every word stated until now. 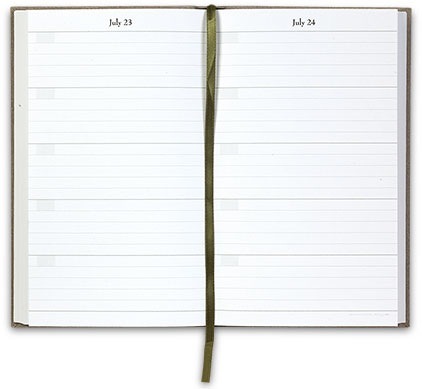 For those not familiar with how a 5-Year Journal works, there are Pages for 366 days, including February 29, with 1 page per day, with 5 line entries – one for each year. It allows just enough to highlight the bullet points of a busy day but forces brevity. It is like Twitter for a private and bygone era. There is no pressure to catalog every detail of life or how you are feeling. Want to simply write a single thought or idea? Well, that is OK too. The beauty is that, those who have felt the pressure of maintaining a journal in the past (like myself) will likely feel far less so with such a low barrier to entry. Take just a few seconds at the end of the day and write what strikes you. The quality is extraordinary. The paper is bright, thick and takes fountain ink well with no feathering. The binding is clearly meant to last as a living document of record to be passed down for generations. The cloth and leather make it a stately addition to any desk or shelf. If I have one concern it is this – will I have enough for all of my years. I am seriously considering buying 10 more right now, for fear that I may not be able to 50 years from now.